Since 1954, Anytime costumes has been offering a wide range of high quality costumes for both kids and adults. Along with the costumes, you can also find accessories; make up items, wigs, hats, props and decoration items. You can find costumes based on various categories and themes like 30’s costumes. Disney costumes, superhero outfits, pirate and a lot more. 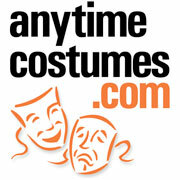 Anytime Costumes offers international shipping to countries including Canada, Australia, France & the UK. Do you love Anytime Costumes?